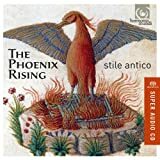 British choir Stile Antico, founded in 2001, has become the young vanguard for Renaissance polyphony in my ears, alongside the more established Tallis Scholars. Their recordings and their live performances -- in Washington, in 2011 and 2013 -- have both justified this admiration. Both of their most recent discs show perhaps a minor few cracks in the foundation (some tremulous sounds in the sopranos, some wobbles here and there, some intonation infelicities) but are on the whole rewarding listening. Last year's The Phoenix Rising was offered in celebration of the 100th anniversary of the establishment of the Carnegie UK Trust, which funded the publication of the Denkmäler, that is, monumental edition, Tudor Church Music. For many composers featured on the disc -- Byrd, Gibbons, Morley, Tallis, Taverner, all so beautifully recorded by Stile Antico over the years -- TCM was the first edition in modern notation available to choral singers, sparking the Renaissance of English Renaissance church music. Byrd's Mass for Five Voices, with its smoldering Agnus Dei, provides the foundation for a selection of motets, including gorgeous renditions of Byrd's evergreen Ave verum corpus and Robert White's extraordinary alternatim Compline hymn Christe qui lux es et dies. 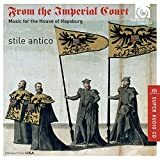 From the Imperial Court, set to be released next month, brings together the music of composers in the employ of Maximilian I and other Hapsburg emperors, including Josquin Desprez, Heinrich Isaac, Pierre de la Rue, Ludwig Senfl, Thomas Crecquillon, and others. The works chosen reveal some intriguing historical moments in the Hapsburg family (these are largely pieces that cannot be sung in a liturgical context), like Isaac's Virgo prudentissima (composed for the Reichstag in 1507, proclaiming Maximilian I as Holy Roman Emperor, with text and music making a nifty parallel between the new words and the cantus firmus at the words "electa ut sol") and Crecquillon's Andreas Christi famulus (probably for a meeting of the Order of the Golden Fleece, whose patron was St. Andrew). There are delightful discoveries to be made, too, including Gombert's six-voice augmentation of Josquin's Mille regretz (alongside the original) and Clemens non Papa's Carole magnus eras.